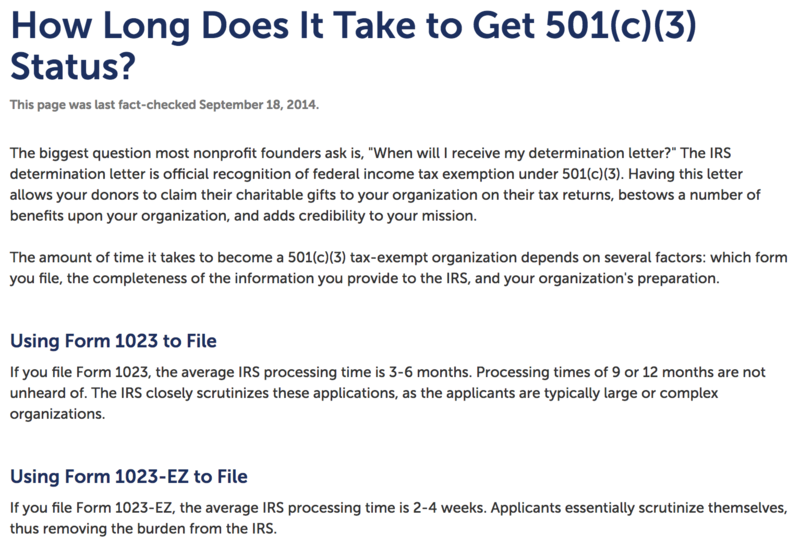 As of today FECORE is still not in the IRS database as a recognized 501(c)(3). Since FECORE is a small mom & pop startup, I would imagine (though can't confirm) that they filed a Form 1023-EZ since the Form 1023 applicant is "typically large or complex organizations." The question then becomes-- if FECORE filed the Form 1023-EZ, why isn't the organization listed in the IRS database by now since those forms typically have a much faster turn-around time? Mike Cavanaugh (President FECORE, aka FE ASTRONOMY), claimed the application was "filed and awaits the IRS approval as of october 17th 2017. Everything is retro active from the start date of the incorporation so your request is denied upon further notice." WHENEVER THEIR CHARITABLE ORGANIZATION FINALLY DOES APPEAR IN THE IRS DATABASE, AT THAT POINT THEY WILL HAVE NO RECOURSE BUT TO MAKE THE DOCUMENTS REQUIRED BY PUBLICATION 4221 OPEN TO PUBLIC SCRUTINY. As of today, 5/19/18, "FECORE" is still not recognized in the IRS database as a "tax exempt organization." Just saying. Correct me if you find it and then we can demand the paperwork they filed with government in support of 501(c)(3) status pursuant to IRS Publication 4221. The question still remains, since FECORE presumably doesn't fall into the category "typically large or complex organizations," did the organization file the much faster Form 1023-EZ to get their coveted blessings from government to shear the sheep? Since a little mom & pop startup presumably filed the EZ form, which has a typical turn-around time of "2-4 weeks," why isn't FECORE in the IRS database 7 months later?! We shall continue to wait for the happy news that the duped sheep may confidently offer up tax deductible love offerings to the Church of FECORE, for needed support of its priesthood, and knowing full well their gifts are blessed by no less than the Grand Overseer-- that shining City on a hill, Washington, District of the goddess Columbia. Question: Are only gifts above the cost of the tiered memberships considered tax deductible gifts? Or can the sheep deduct the cost of membership, with the contractual obligations put on the Church of FECORE to provide agreed upon considerations for the cost of those tiered memberships? Seems to me a gift requires nothing in return, however, a membership implies considerations returned for that membership cost-- especially when tiered memberships being sold by the Church of FECORE stipulate what considerations are returned in exchange for the escalating annual cost of each tier ($25, $50, $250). No. I think probably the priesthood should publicly post a disclaimer that sheep who pony up the money for tiered "memberships," enjoining certain contractual obligations returned based on tier cost, cannot deduct membership cost from their taxable income. After all, the Church no doubt wishes to remain pure. And let us never forget; one of the illustrious priests of the Church of FECORE has a special message tattooed on the back of his neck of esoteric importance in these calamitous end days-- but most earnestly directed toward any rascally future executioner who may be stalking brethern of the faith in the name of everything evil, what with his head-lopping ax as part of his standard load-bearing equipment while endeavoring to overthrow the Christianity that was put on display at Shillfest 2017. Amen & amen. "FE Core is established as a tax exempt non profit organization under the U.S. Code 501(c)(3) Internal Revenue Service regulations...."
"FE Core is in the process of establishing as a tax exempt non profit organization under the U. S. Code 501(c) (3)"
Why are they, these months later, still "in the process"? If they were acting as though they were then "established as a tax exempt non profit organization," why are they now "in the process" of doing the thing they claimed from the start they had already accomplished? Just saying. 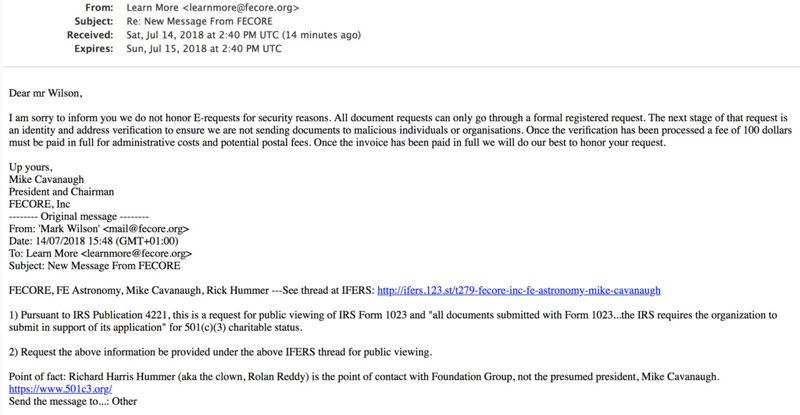 Why would the fellow, Rick Hummer, be the one to "tell the entire story very soon," if he wasn't in fact the clown playing the part of the clown, Rolan Reddy, man on the street having a "happenstance" meeting with the clown, Neil Tyson? And who died and made the clown, Robbie Davidson, a spokesperson for the clowns Rollan Reddy and Rick Hummer, on clown Steere's show as he was performing wrench duties on behalf of the controlled opposition agent? And why does Davidson, of his own volition, feel compelled to associate "nefarious" with Rick Hummer revealing the "entire story very soon"? 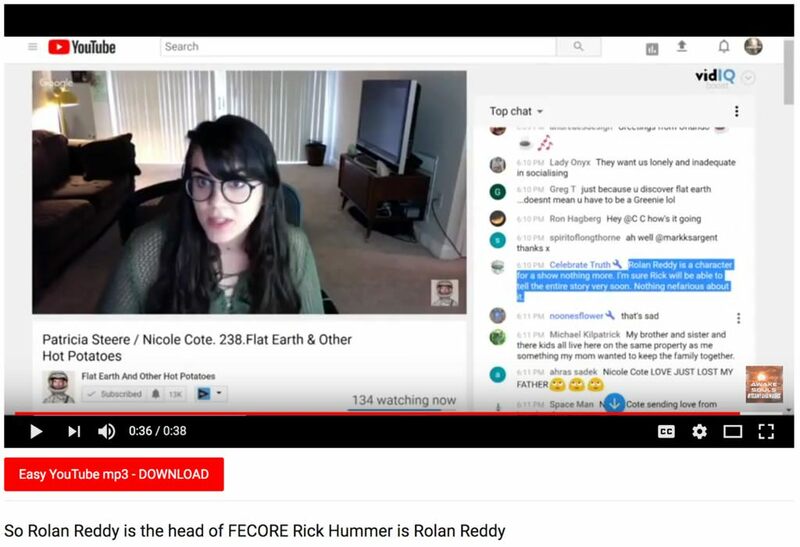 "So Rolan Reddy is the head of FECORE Rick Hummer is Rolan Reddy"
"Accusations of Shillery. Featuring IPS and FECORE founder Rick Hummer aka Rolan Reddy"
Note in the above YouTube still, the square chin, the horizontal crease just under the lower lip, and the bald area of the chin (similar in each pic). There are also pronounced creases of the face from nose to corners of the mouth. The fake buck teeth cause the upper lip of the Reddy character to exaggerate the creases in the pic on the left. EDIT: I listened to as much of it as I could bear. The FECORE Inc. clown, Rick Hummer, is the clown, Rolan Reddy (an act within an act), who infamously claimed (Shillfest 2017) that the tattoo on the back of his neck is a message to any imagined future executioner come to lop off Hummer's head in the glorious end days before Jesus appears on his white steed. Ask yourself the question; who really is the boots on the ground coordinating this massive controlled opposition operation? And finally, it appears that both Bob Knodel and Patricia Steere were in the chat room during the above fiasco of prattling mumbo jumbo. Both were addressed by the participants though neither spoke during what was, a waste of everybody's time (except that we now know Hummer is Rolan Reddy). All in all, a festering pool of malignant cancer on the body of flat Earth knowledge. I requested information pursuant to IRS Publication 4221 and the president, Mike Cavanaugh, refuses to comply with said request. They historically claimed, “FE Core is established as a tax exempt non profit organization under the U. S. Code 501(c) (3) Internal Revenue Service regulations….” That claim can be found archived on the Wayback Machine at, https://web.archive.org/web/20171216103509/http://fecore.org:80/about-us. I believe fraud is being perpetrated in that they claimed to be recognized as a legitimate 501(c)(3) in the past, but are now claiming to be “in the process” of becoming a recognized 501(c)(3). I am sorry to inform you we do not honor E-requests for security reasons. All document requests can only go through a formal registered request. The next stage of that request is an identity and address verification to ensure we are not sending documents to malicious individuals or organisations. Once the verification has been processed a fee of 100 dollars must be paid in full for administrative costs and potential postal fees. Once the invoice has been paid in full we will do our best to honor your request. 1) It's really not our intent to give the appearance that it's a family-friendly event-- all children will have a ticket (after all, it's really about the partying and cultish veneration of the Toxic Twins as they parade about in their ritualistic garb for a couple days). 3) You better hope, when considering paying $770.74 for an 'Exhibitor Table' in order to hock your flat earth trinkets, that the exorbitant entrance fees being charged to come gawk at the Toxic Twins' performance doesn't scare away throngs of people from the laughably overpriced big shoo. Roll the dice! 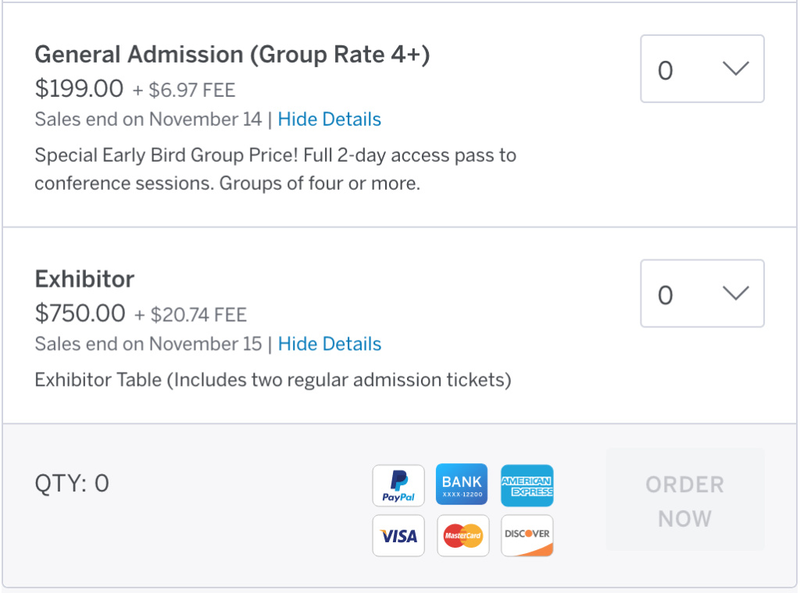 4) I imagine there will be a lot of networking amongst zealous Toxic Twins fans leading up to the big shoo, as they buddy-up to take advantage of the $50 price break per ticket for the Group Rate of 4+ people. They will even save $1.25 per ticket on the associated 'Fee' by simply quadrupling up on their ticket purchases-- Toxic Twins Nirvana! 6) What if everybody decides to pay the $349 'All Access' fee so they can hope that the mere shadow of the Toxic Twins passing over them heals them of their afflictions while seated on the front row? That's going to be one packed front row-- heaven on earth! 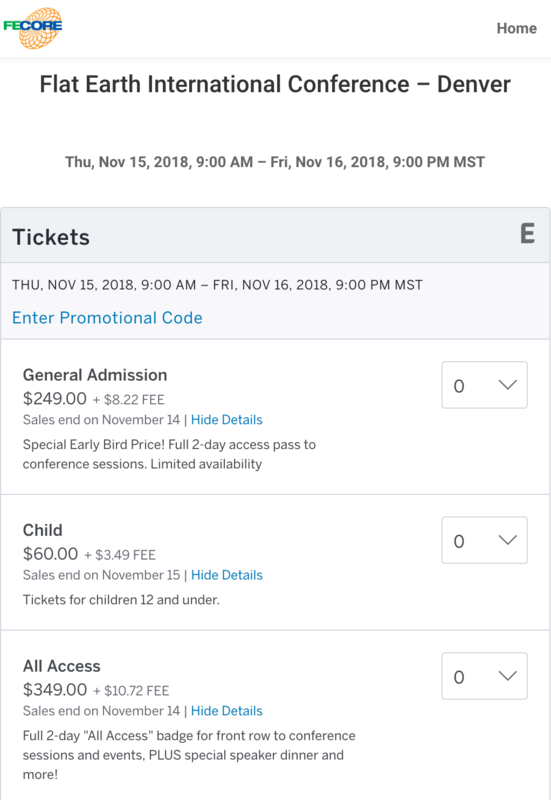 We'll have to seek clarification if children, at $63.49 per ticket, are precluded from sitting with Mommy & Daddy on the privileged front row should they buy the 'All Access' tickets for themselves. "FLAT EARTH Convention 2017. Christian Proselytising questioned by Marmar"
Robert Scott claims, "The final piece of the puzzle is to submit form 990 to the IRS," but Form 990 is NOT part of the tax-exempt application process. It is filed annually after tax-exempt has been granted. I wonder why Robert Scott is conflating the tax-exempt application process with an an annual requirement to file Form 990 with the IRS after it has received tax-exempt status? Perhaps Robert Scott should speak with Mike Cavanaugh so they can get on the same page. 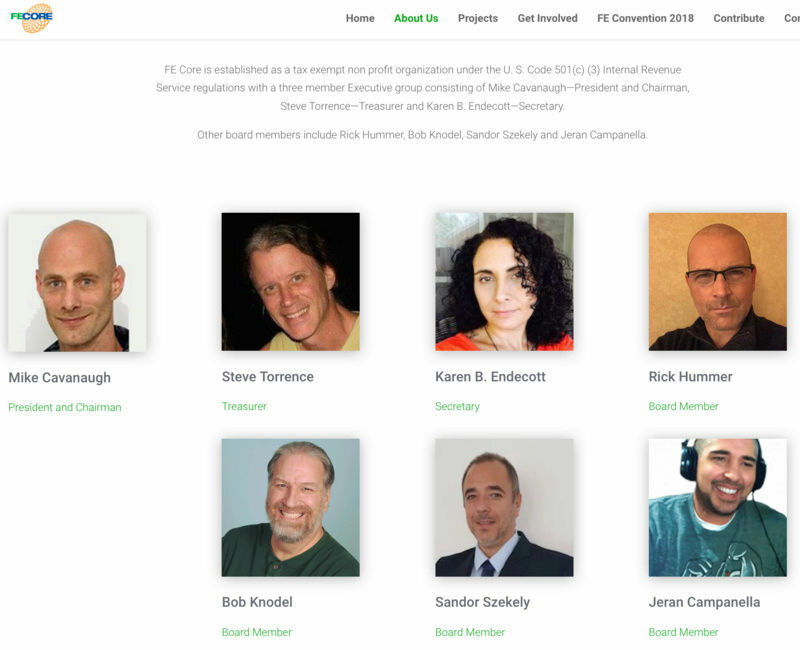 And since the buck-toothed clown, Rolan Reddy, is the point of contact with Foundation Group, Messrs. Scott and Cavanaugh might contact him for clarification as to whether FECORE does have somebody "working full time" on the tax-exempt application, or not. Robert Scott, October 4, 2018: "No one is working full time as a business manager or an accountant to manage the incorporation process." Mike Cavanaugh, October of 2017: "The organisation working on our 501c3 status is Foundation Group in Nashville TN." FE Core has now taken thousands of dollars from well-meaning flat-Earthers and concluded "Earth is concave"
Weren't Fecore the guys who told us the seas were flat and the land convex ? I remember at the time the experiment carried out with tall buildings in reference to the plane - thought this was reasonably well done . However when I saw their model spinning in space i realised that this groups' main aim was to save Nasa's holywood space film industry . "Breath easy astronomy and gravity - you are safe with fecore, type model . I've listened to 10 mins of that interview where the "force the level" experiment seem to be getting confused with Mullins' " force the line experiment " - maybe deliberately so. Might listen to the rest later but this organisation doesn't sit well with me . Hell of a conclusion to reach after surveying 525m . Gatekeepers spring to mind . Think the leaders may have entranced some gullible people . Thanks for the preceding info as well.